The lingam is the symbol of the Hindu god Shiva. There are numerous lingams throughout India, but the twelve Jyotir lingams or ‘lingams of light’ are the holiest and most worshipped of all. Jyoti means ‘light’ and lingam means ‘mark’ or ‘sign’. According to Hindu tradition, the Jyotir lingams pilgrimage washed off bad karma and makes the soul and body pure. The Siva Mahapurana, an ancient mythological and religious scripture, tells of a quarrel between Brahma the creator and Vishnu the preserver. Each claimed to be the Supreme Lord and a terrible battle ensued, plunging the universe in confusion and causing great distress to living creatures. Shiva was moved by compassion and manifested in a blazing pillar of light, challenging Brahma and Vishnu to find the base and top of the pillar. Brahma took the form of a sign and vanished into the sky, hoping to see the top of the pillar. Vishnu took the form of a boar and dug down into the earth to find its base. Neither could find what they were looking for. They came back exhausted and disoriented. At that moment, the central part of the pillar opened up and Shiva was revealed in all his glory. Brahma and Vishnu realised they were wrong and acknowledged Shiva as the Supreme Being. 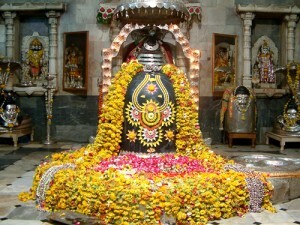 The Jyotirlingams are located in places where Shiva appeared as a pillar of light. Each one bears the name of the deity that lives there; each of these deities represents a different aspect of Shiva and a different energy. 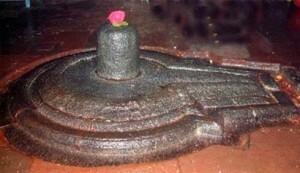 A distinction is made in India between two types of lingam: Manusi lingams are man-made lingams and Swayambhu lingams are ‘self-created’ or natural lingams, discovered in the places where they now stand. Most of these are oval-shaped stones. The twelve Jyotir lingams are all natural lingams. In most cases they have not been moved, a temple having been built around them where they were found. 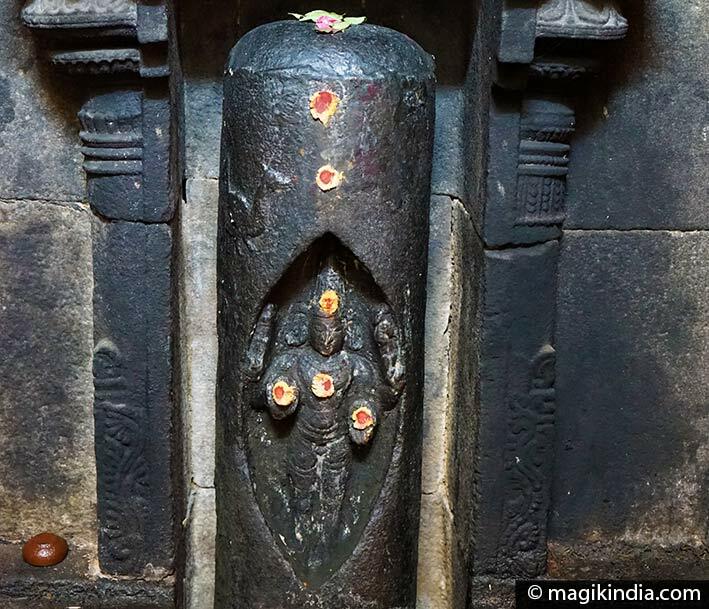 These ‘lingams of light’ do not need a prana pratistha, the Hindu ceremony for consecrating an idol, because a Jyotir lingam already inherently embodies the power of Shiva. At the spiritual level, the twelve Jyotir lingams symbolise the state of enlightenment. Humans are completely absorbed by material life and worldly preoccupations; they do not know there are other states of consciousness and that they are capable of achieving them. The Jyotir lingams show us that there is a higher goal in life, beyond our earthly incarnation. 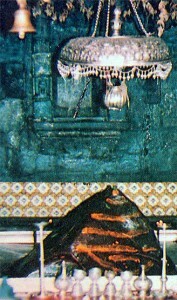 A Jyotir lingam represents Atman, the soul. Coming into contact with the light of the lingam awakens a person’s inner light, the light of Atman. 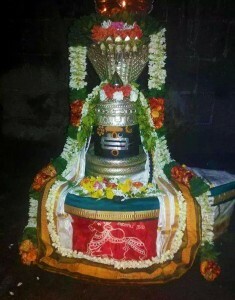 The Jyotir Lingam Mallikarnuja is located on the hill of Sri Sailam in the city of Kurnool (Andhra Pradesh). This is one of the oldest and most sacred cities in South India, located on the banks of the Krishna River. Sri Sailam is a “Shiva Shakti Peetha” or “siddhakshetra”, ie where Shiva and Parvati reside permanently together. The temple is also one of 18 “Maha Shakti Peetha”. According to one of the legends mentioned in the Skanda Purana, the Jyotirlinga was discovered by a princess named Chandravathi. This princess took refuge in the mountains of Sri Sailam to escape her father’s improper advances. 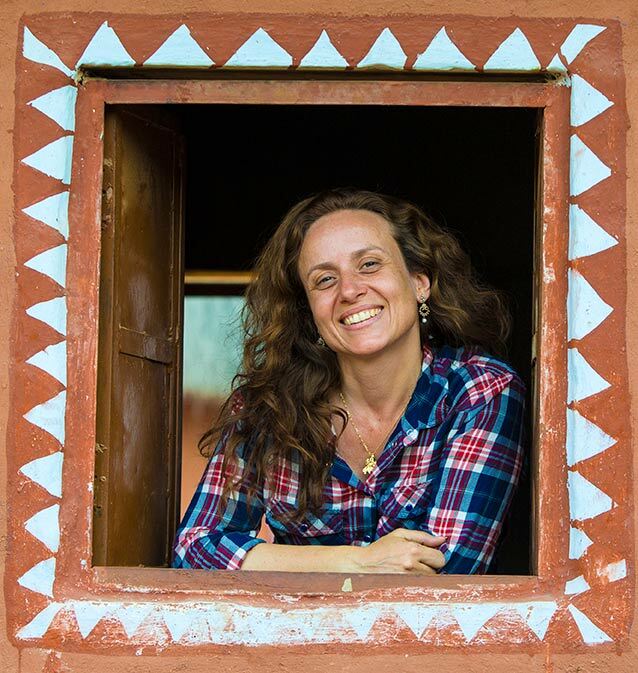 One day, she saw in the forest a cow pouring its milk on a rock in the shape of a Shiva-lingam. The next night, Shiva appeared to the princess in a dream and told her that this rock was the manifestation of his presence. A temple was later erected there. From that time Chandravathi led daily worship to the Shiva lingam with flowers of Jasmin (Mallika). One day Shiva appeared and Chandravathi begged him to constantly wear a jasmine garland on his head. She also asked him to become his consort. He agreed and said he would be known here as Mallikarnuja and gave her the name of Brahmaramba. At Omkareshwar the river Narmada divides into two channels around an island called Shivapuri. The island, 4km long and 2km wide, is said to be in the shape of Hinduism’s symbolic syllable “OM” (ॐ) – whence the name Omkareshwar. The Narmada is one of India’s seven sacred rivers, the others being the Ganges, Godavari, Kaveri, Saraswati, Sindhu and Yamuna rivers. Legend has it that the Narmada was the sweat that flowed from Shiva’s body when he danced his cosmic dance, the Tandhava. Ujjain is one of the Sapta Puri, India’s seven most holy cities, and as such it is a major pilgrimage centre. 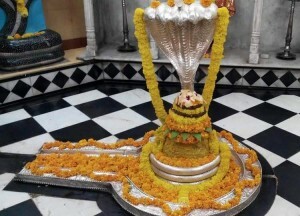 It is especially holy owing to the presence of Mahakaleshwar, “Lord of time and death”, one of the 12 Jyotir Lingams or “Lingams of light”. 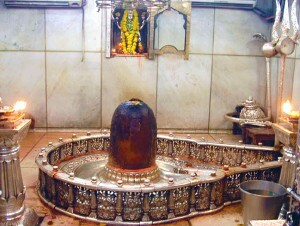 There are two Jyotir Lingams in the state of Madhya Pradesh, the other being Omkareshwar. Once every twelve years Ujjain hosts the Kumbha Mela, the world’s largest religious gathering. The temple is not directly accessible by road. It is reached by a trek of 18 km. The Jyotir Lingam is located atop the Sahyadri hill near Pune. The Bhima River has its source in this city. One of the legends relate that King Kamrupeshwar, King of Kamrup, was an ardent devotee of Lord Shiva. One day a demon appeared in his kingdom and began to disturb his subjects. The demon also tried to kill the king Kamrupeshwar with his sword. However, he missed the target and the sword fell on the Shiva-Lingam worshipped by the king. Lord Shiva then appeared and killed the demon. 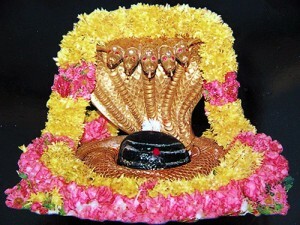 It is said that after killing the demon, the drops of sweat of Shiva fell on the ground and were turned into a stream. This stream has then turned into a river named Bhima, the very one that flows through the city. The Kashi Vishwanath temple with its golden dome is the heart of Varanasi. Here the principal divinity is known as Vishwanatha or Vishweshwara, which means ‘ruler of the universe’. According to the legend in the Shiva Purana scripture, Shiva created a city and placed it on his trident, declaring that this city would be dedicated to austerities and that the faithful should go there to obtain the benefit of its spiritual aura. An earring fell from Shiva’s ear at the site of the Manikarnika Ghat. 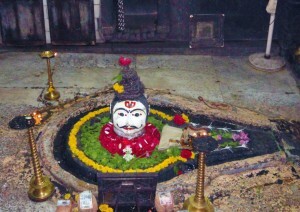 Shiva appeared there as Rudra and consecrated a Jyotir lingam. He declared that this lingam was a part of himself. He took the city from the tip of his trident and placed it on the bank of the Ganges. 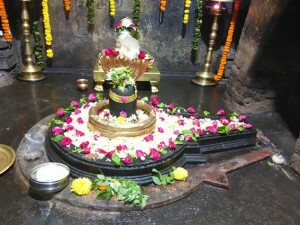 The Trimbakeshwar Jyotir Lingam is situated in the village of Trimbak, 30 kms away from Nashik. It is also known for being the place where the Godavari river rises. This is one of the seven sacred rivers of India. Legend has it that after a plot concocted by Rishi Kapila, the sage Gautama was accused of killing a sacred cow (gauhatya). He was then banished. Gautama had to perform a long penance (tapasya) on the Brahmagiri hill that rises above the present temple. He invoked the sacred Ganga and took a bath to wash his sin. He led together with his wife Ahalya hundreds of pujas (rituals) on thousands shiva lingams. Happy to see this devotion, Shiva blessed him and brought on earth the Ganges, the holy river, which asked Shiva to remain in this place. The devotees who come to visit the temple, are to do ablutions in the Kushavarta Teertha (sacred pond) first to purify themselves. It is believed that bathing in the waters of the Godavari bring “moksha” or salvation. 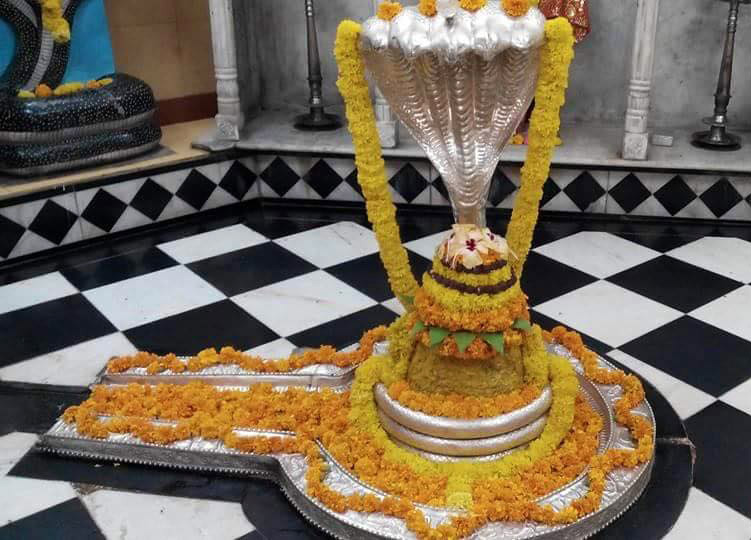 Vaidyanath or Baidyanath is a temple complex located in the city of Deoghar composed of the main Baba Baidyanath temple where the Jyotirlinga is installed, and 21 other temples. According to the legend told in the Shiva Purana, the demon Ravana, king of Lanka, estimated that his capital would not be perfect or immune to enemies unless Shiva remains there forever. He did intense austerities in that way. Ultimately, Shiva gave him a lingam he could take with him in Sri Lanka. Shiva told him though not to put the lingam down otherwise it would remain fixed there forever. The other gods were worried about Ravana’s new power. They thought that if Ravana could bring the lingam in Sri Lanka, he would then become invincible. On his way back to Mount Kailash, Ravana wanted to make a Sandya-Vandana (recitation of the Vedas three times a day). He looked for someone who could hold the lingam during the ceremony. Lord Ganesha appeared dressed as a shepherd. Ravana asked him to hold the lingam and performed the ritual. Ganesha, pretending the ritual was taking too much time put the lingam down, which fixed there. When Ravana returned, he could not move the lingam. So the lingam remained at Baidyanath and the gods were happy. Nageshwar temple houses the Lord of Cobras. it is situated 18km north-east of the sacred town of Dwarka. 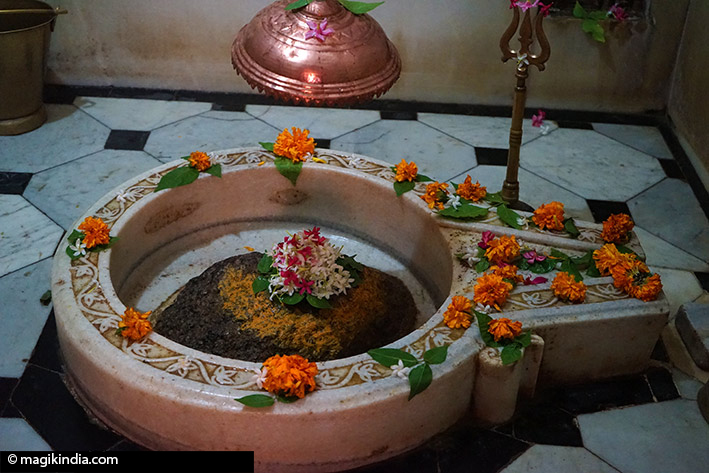 Nageshwara is a lingam made of Dwarka Sila or coral stone from the Gomati river in Dwarka. Dwarka Shila is a sacred stone to Hindus; it is marked with chakras (wheel-like motifs). The number of chakras on a stone determines which god it is dedicated to. The Puranas (old sacred scriptures) say that anyone who touches a Dwarka Sila obtains spiritual liberation. It is also said that whoever prays to Lord Nageshwar is freed of all mental poisons. Ramanathaswamy temple is a major pilgrimage site for Hindus, for several reasons. 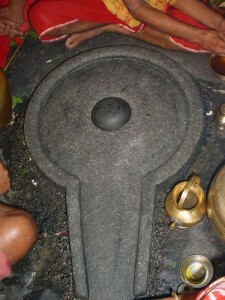 It contains one of the 12 Jyotir Lingams or “lingams of light”. It is also one of the 275 Paadal Petra Sthalams, the Shiva temples glorified in the verses of the three most venerated Nayanars (Shivaite saints), Appar, Sundarar and Tirugnana Sambandar. Near the Ellora caves, in a small village called Verul, stands the Lord of Tapasvi. It is believed to be the last Jyotir Lingam, and it is where the pilgrimage round the Jyotir Lingams ends. The legend goes that a pious woman called Kusuma worshipped Shiva daily by immersing a Shiva Lingam in a lake. Her husband’s first wife, jealous of her devotion, murdered Kusuma’s son in cold blood. Despite her grief, Kusuma did not interrupt her daily ritual and when she immersed the Shiva Lingam in the lake her son was miraculously brought back to life. Shiva appeared before her and the villagers, and from that time on he has been worshipped in the form of a Jyotir Lingam. 1- Somnath, bull (Vrishabh) – is the Moon’s exaltation. It is the place of abundance and fulfillment. It is the place of Rasa, the nectar, good taste. Also health, the strength of Ojas, the immune system. The mantra is Aum Namah Shivaya Namo Somanathaya. 2 – Rameshwar, Aries (Mesh) – is named after Lord Ram, who is the incarnation of Visnu who represents perfect Dharma. Aries is the Sun’s exaltation, this is where the Sun has the most vitality, vigor and ability to express its energy. This is a place of power and control, a place of leadership, kings and generals. The Sun significates our dharma, it is concerned with righteousness, justice and truth. The Mantra is Aum Namah Shivaya, Namo Rameshwaraya. 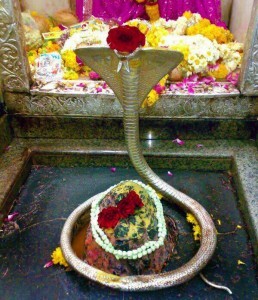 3 – Nageshwar, Gemini (Mithun) – is named after the Snake lord. According to Jaimini it is the exaltation place of Rahu. It has the power to reach the masses, the power to manipulate communication. The mantra is Aum Namah Shivaya Namo Nagesheshwaraya. 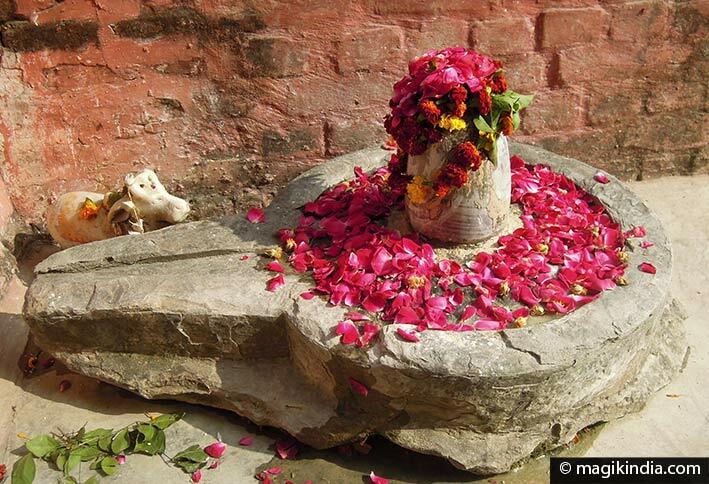 4 – Omkareshwar, Cancer (Kark) – Omkareshwar is the jyotir lingam which represents the Lord in the form of omkar. Sometimes Aum is connected with Siva as it is the primal sound of which all others arise. Sometimes it is connected with Ganesh as it comes before all other words in prayer. Sometimes it is used as a transcendental word for denoting the divine, or the primal and vibration of the universe. Cancer is Jupiter’s exaltation and thereby is the strength and blessings of the Guru. It is the place of the highest use of the Dhi shakti, the power of intelligence. The mantra is Aum Namah Sivaya Namo Omkareshwaraya. 5 – Grineshwar, Scorpion (Vrishchik) – is the Lord of Tapasvi who lives in the jungles or remote areas. It has the power to forgive you of earlier sins. Dhusaneshwar vowed to forgive everyone. The mantra is Aum Namah Sivaya Namo Dhusaneshwaraya. 6 – Malikarjuna, Virgin (Kanya) – is the greatest bhakta. It is the exaltation of Mercury. The mantra is Aum Namah Shivaya Namo Malikarjunaya. 7 – Mahakala, Libra (Thula) – is Shiva as great Time. It is the exaltation place of Saturn as the governor of time. Saturn is the son of Chaya, the shadowy one, who has all the curses. Jyotishis go to this Lingam to get the knowledge of time, Varahamahira used to worship at this Lingam. A watch is the yantra of Mahakala, and therefore should not be worn on the right hand, the right hand belongs to Jupiter, the left hand belongs to Venus. The mantra is Aum Namah Sivaya Namo Kaleshwaraya. 8 – Vaidyanath, Lion (Simh)- is Shiva as the divine physician. Vaidya is the Sanskrit word for doctor which literally means one who has the knowledge, and nath means lord. From the Vedas, Rudra was called the first physician, Shiva is the modern day form of Rudra. Vaidyanath has an eight house connection being associated with Scorpio the natural ruler of the eighth house. It is healing that has to do with holistic modalities working on the spiritual, and psychological as well as physical level of healing. The mantra is Aum Namah Shivaya Namo Vaidyanathaya. 9 – Vishwanath, Sagittarius (Dhanu) – is the lord of all gods. According to Jaimini, Sagittarius is the exaltation of Ketu. It is a place of spiritual liberation. Ashes are taken to Kasi Vishwanath to get liberation. The mantra is Aum Namah Shivaya Namo Vishwanathaya. 10 – Bhimashankar, Capricorn (Makar) – is Shiva as the great warrior. Capricorn is the exaltation of Mars. Shiva has always incarnated with Lord Visnu whenever He can be of service. In the Ramayana Shiva incarnated as Hanuman, the hero of the epic. In the Mahabarata, Shiva incarnated as the great warrior Bhima. The mantra is Aum Namah Shivaya Namo Bhimashankaraya. 11 – Kedarnath, Aquarius (Kumbh) – Aquarius is the sign of Saturn and Rahu. It is a sign of ingenuity. 12 – Triambakeshwar, Pisces (Meen) – is the three eyed Lord. Pisces is the exaltation place of Venus. Venus did Tapasya (hung from one leg in a tree for twenty years) to have the power to bring back to life. Spiritually, Venus brings us back again and again to get moksa (liberation). One will come with Venus uchha when ready for liberation, it is She who is exalted in the last sign of the zodiac. Bija Aum Jum Sa. The mantra associated with Triambakeshwar is the Mritanjayi mantra which cures disease and asks that one be made ready for liberation like a ripe fruit ready to fall off the vine.